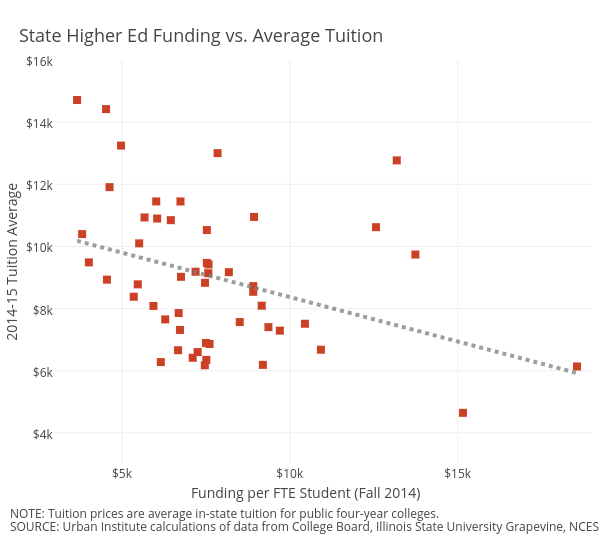 Tuition prices are influenced by far more than just state funding. View and compare differences for each state. When it comes to paying for college, tuition costs depend on large part on where students live. Some students attending four-year public colleges spend roughly double that of those in other states, with average in-state tuition ranging from less than $5,000 in Wyoming to $14,700 in New Hampshire. Observers have paid a lot of attention to the amount states invest in higher education, which has slowly started to increase recently, but generally remains below pre-recession levels. There are, however, a range of other factors that further influence how much college costs in each state. An Urban Institute report published earlier this week details why there’s so much variation in how states fund higher education and what their students pay. Higher education serves as a major area of discretionary spending in state budgets, and funding took a hit when revenues plummeted after the onset of the recession. Then there are states like New Hampshire, which doesn’t collect general sales or income taxes, that simply don’t have the resources to raise funding. As an illustration of the variation, seven states spent less than $5,000 per full-time equivalent (FTE) student in 2014, according to the Urban Institute’s calculations. Five others spent more than $12,000, led by Alaska’s $18,554 per student. But because of other factors, higher funding levels don’t always translate to lower tuition costs when compared to other states. Quite a few states stand out as outliers. Illinois’ tuition costs are among the nation’s highest, despite the fact that its funding exceeds that of most other states. The report attributed this, in part, to recent contributions to the state’s underfunded university retirement system. In Connecticut, state funding is similarly higher than all but four other states, yet tuition remains above the national average. By comparison, although Montana’s funding of $6,151 per FTE student is lower than most other states, its average tuition remains among the nation’s lowest for four-year colleges. Tuition prices also reflect how much colleges rely on tuition dollars -- another factor that varies greatly from state to state. Tuition accounted for 84.5 percent of fiscal 2014 public higher education revenue in Vermont, compared to less than a quarter of revenue in California and Wyoming, according to State Higher Education Executive Officers. Many colleges looked to offset losses in state funding by increasing tuition costs. Some states, however, impose limits on annual tuition hikes. Missouri schools charging above the state average are permitted to raise tuition up to the annual change in the consumer price index. In Maryland, tuition increases are tied to a three-year rolling average change in median incomes. Average tuition costs referenced here are “sticker prices” and don’t reflect what students pay with financial aid. Tuition also represents only part of the much larger total cost of attending college that includes housing, food and other expenses. Differences in instructional expenditures further explain why tuition prices vary. These costs ranged from $5,720 per FTE student in Florida to $14,620 in Delaware for public four-year colleges during the 2012-2013 school year. Teacher salaries, pensions and differences in cost of living all play a role in pushing costs up or down. Part of the contrasting instructional expenditures also relate to the individual types of colleges and universities within a state. Research universities, particularly schools with large engineering or medical schools, are much more expensive to operate than community colleges, for example. The mix of academic programs that schools offer accounts for some of the larger differences in expenses, said Sandy Baum, who co-authored the report. Operating costs for two-year colleges are generally well below that of four-year institutions, and some states have much higher shares of their students enrolled in these schools. Two-year institutions account for more than half of enrollment in 12 states, but less than a quarter of enrollment in six others. The Urban Institute’s Baum also noted significant differences in how well colleges attract out-of-state students. This matters, too, as the higher tuition prices these students pay further help to fund colleges’ operating costs. This table lists a few of the measures from the Urban Institute report, representing totals for different years pulled from various sources (see notes below). See additional state data here. Average 4-year tuition: Annual rates are in-state tuition for public four-year schools. Published by College Board, Trends in College Pricing. Funding per FTE student: Amounts, shown in 2015 dollars, are Urban Institute calculations of data from Illinois State University Grapevine and the Digest of Education Statistics published by the National Center for Education Statistics. State funding per $1,000 in personal income: Figures represent state higher education funding. Published by Illinois State University Grapevine. Instructional expenses per FTE student: Totals are for four-year public institutions. Published by National Center for Education Statistics, Digest of Education Statistics. Share of enrollment in two-year institutions: The percentage of FTE public undergraduates enrolled in two-year colleges. Published by the College Board.